Today Pilates North is much more than a studio. We have created a community for all our Pilates friends to come, grow and share. Knowing the work, care and time we have put into building our business makes the success even more enjoyable. And how many people can say they get to work with their best friend every day…. 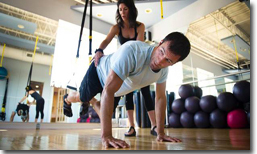 If you are looking for a challenging new workout, you may want to consider Pilates North’s Barre45 program. 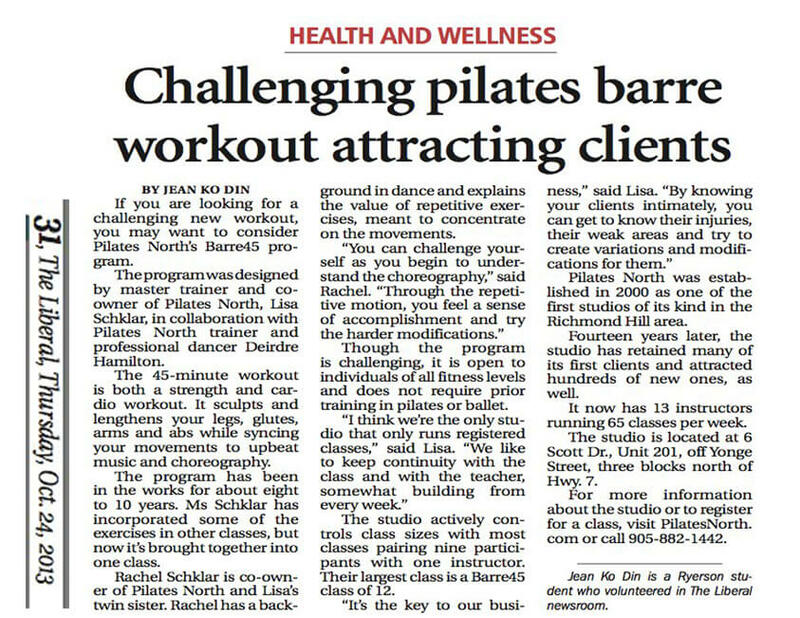 The program was designed by master trainer and co-owner of Pilates North, Lisa Schklar, in collaboration with Pilates North trainer and professional dancer Deirdre Hamilton. The 45-minute workout is both a strength and cardio workout. It sculpts and lengthens your legs, glutes, arms and abs while syncing your movements to upbeat music and choreography. 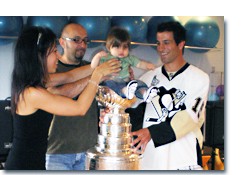 After winning the Stanley Cup with the Pittsburgh Penguins, Mike Zigomanis has returned home for the summer to continue his off-ice training with Lisa Schklar of Pilates North in Richmond Hill. In 1995 a tradition started wherein each member of the Cup-winning team is allowed to retain the Cup for a day. As a member of the championship team, Zigomanis had the Cup on July 26, and made time to stop at Pilates North to help raise money for Sick Kids Hospital. Lisa has been working with Mike intensively during the off-season. Primarily focused on keeping his core stability and working on flexibility for injury prevention and strength. It was during one of their two-hour sessions that Mike broke the news about bringing “Stanley” to the studio. Nine years ago two sisters, Lisa and Rachel Schklar, left the corporate world to start a Pilates fitness business. Today, without any help from outside agencies, their company is thriving. Small and medium sized business are a large part of Canada’s economy and produce about half the countries GDP and employ 6 our of 10 Canadians. Beverly Thomson interviews the Rachel and Lisa of Pilates North to discuss the upcoming Federal election and whats on the Small Business Ballot. Hockey Pro Trades Hours of Gym Time…. Toronto Marlies forward Michael Zigomanis, 31, played 22 games with the Pittsburgh Penguins during the glory years. 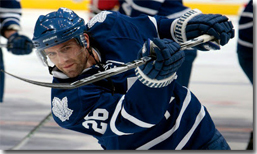 The powerful hockey player follows a plant-based diet, and is a hiker and trail cyclist. He recently completed the Toronto Bed Race on Danforth, a fundraiser for Toronto East General Hospital. He trains using restorative exercises designed to give him an advantage on the ice. Ten years ago, I used to work out with professional NHL player Gary Roberts. Gary used to say, ‘If flexibility and nutrition aren’t A-1, your training suffers.’ That’s why I changed my diet – five years ago I gave up red meat and eventually seafood and dairy with encouragement from my sister who’s vegan, and tried Brendan Brazier’s Thrive Diet – and why I don’t hammer out four hours in the gym. I’ve been going to Pilates North for six years, four times a week. It helps me deal with and prevent injuries. I came to it after ab surgery in 2004. I like strengthening my core with Lisa Schklar. Since then I’ve had shoulder, hip and hand surgeries – all hockey related – and the Pilates and vegan diet help my body heal. After a back injury sidelines Igor, Glen Peloso brings the hardy construction worker to Pilates North for some back-to-work rehabilitation. Sam and Rifca came to Canada over 25 years ago with nothing but their entrepreneurial spirit and hope for a better life. They started their first business venture together, but they’ve both suffered severe health set-backs. Their only saving grace is their five daughters who stepped in and have kept the business alive. Will Chef Brad Long and Designer Glen Peloso be able to transform the Pita Stop into a valuable family jewel before the last of their business peters out? As a repeat guest of Rogers Television Daytime, Lisa offers information on health and fitness issues for the York Region community… And gives Jacqueline and George a thorough workout! Daytime is York Region’s only daily, live lifestyle program showcasing everything the region has to offer. Jacqueline Betterton & Geroge Tsioutsioulas bring their dynamic and fun-loving personalities to the screen every weekday morning offering up lots of laughs, tons of relevant information to York Region residents and a healthy dose of local matters. Daytime airs weekdays LIVE at 11:00am with encore presentations at 5:00pm and 11:00pm. Connecting readers to the collective wisdom of the 100’s of small business owners they met during their cross country RV tour, authors David Wilton and Kyle McNamara introduce you to these business success stories. This book demonstrates how small business owners are unlocking the potential in their small businesses by focusing on key areas and capturing the drive, ambition and passion of Canadian entrepreneurs. 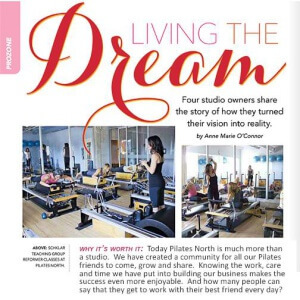 “With just enough money for one month’s rent and none for advertising, twin sisters Rachel and Lisa Schklar opened Pilates North nine years ago in a 700 square foot studio and began going door to door to find customers willing to try one of their five weekly classes – for free! Today this thriving small business runs 50 fully registered classes per week, trains professional athletes, has moved to a 3000 square foot studio, has a continual wait list and twelve trainers on staff – all of whom were once customers. A Richmond Hill fitness studio held two classes to raise money for the Breast Cancer Research Fund. Pilates North was one of eight studios in Canada to join the Pilates for Pink Campaign. Through classes Friday and Sunday, Pilates North raised $1,600 which will be added to the $150,000 the campaign was looking to raise across Canada. The studio donated the teachers’ time and studio space and matched all client donations dollar for dollar. Raising money for the Breast Cancer Research Fund is not the only fundraiser in which Pilates North actively participates.The studio, on Scott Drive near Yonge Street and 16th Avenue, also offers weekly walking groups where all proceeds go to the MS Society of Canada and makes an annual contribution to Sick Kids Hospital. 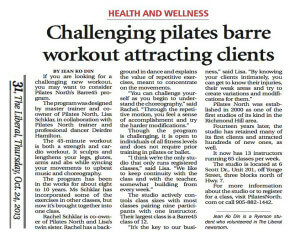 Update: Pilates North featured in the Richmond Hill Liberal again, for our new Pilates Barre45 workout. You’re almost there when you hit Highway 7, where electrical towers punctuate the sprawl. From the outside, the two-storey building just west of Yonge Street is uninspiring, but up on the second floor is a sunny suburban oasis. “We don’t just fit anyone in for a buck,” says Rachel Schklar, who co-owns the Richmond Hill studio—one of the largest Pilates studios at 3,000 square feet—with her sister Lisa. Of the 50 or so classes offered each week, most are geared to intermediate- or advanced-level training, and if you’re thinking of joining, a $70 placement assessment—50 per cent of which is applied to a future class—is required before you’re slotted in. Eight Reformers, nine chairs and two Cadillacs are reserved for intermediate and advanced classes; beginners must first conquer two levels of mat routines before they’re allowed on the equipment. There are no drop-in classes, but registration is ongoing and progressive; a nine to one student to instructor ratio means no one gets off easy—especially during the Plank position.